Manual therapy is a “hands-on” approach to healing used by many physical therapists as part of a recovery program. It’s not the same type of treatment as chiropractic or massage therapy, although manual therapy is often mistaken for those. A physical therapist will use his or her hands instead of exercise or medical equipment to apply pressure directly to muscles or joints. The goal is to increase circulation and relieve pain from a wide variety of injury types. In fact, your physical therapist will probably use manual therapy as a method to assess an injury during your first appointment. If you have any questions about this non-invasive form of physical therapy, call our office to set up an appointment. Manual therapy is usually divided into two different types of physical therapy: Soft tissue work and mobilization/manipulation. For soft tissue work, your physical therapist will apply pressure to (you guessed it) soft tissues, such as muscles. This has proven to be very effective in various forms of pain relief. It’s also used to break up scar tissue following surgery or an accident and to increase circulation. Mobilization/manipulation techniques are used to twist, pull, push or otherwise manipulate bones and joints into the proper position. The range of motion can be severely restricted in your limbs following an injury, so mobilization/manipulation therapies are aimed at restoring proper joint function. 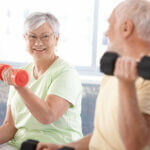 We offer in home physical therapy for seniors. Contact First State Rehab at Home that serves the surrounding areas of Wilmington, New Castle County & Kent, DE centers.